Even a casual observer would notice that there’s not much difference here. One might even speculate that they came from the same voice, or at least two closely related voices – perhaps even twins. 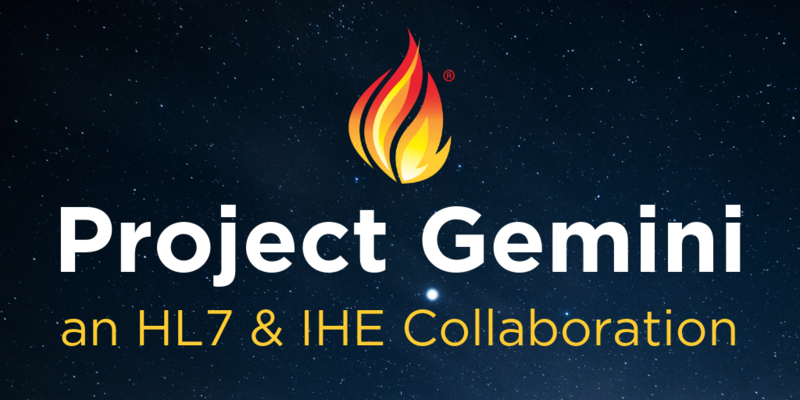 And that’s the conclusion that led HL7 and IHE to agree to work together on Project Gemini. This posting reflects only my personal observations on Gemini, but many more details will be made available from the Gemini Steering Committee in the coming months. The name “Gemini” invokes – in addition to twins – the U.S. space program that served as a bridge between Mercury and Apollo in the U.S. quest to land a man on the moon. This new Gemini aims toward another type of moonshot: the quest for interoperability. Gemini originated out of two parallel activities. In February 2018, Joyce Sensmeier representing IHE/HIMSS and I, representing HL7, presented a vision for improved collaboration at the HIMSS 2018 Interoperability Showcase. Meanwhile, Jürgen Brandstätter of IHE was proposing a strikingly similar initiative to the IHE International Board. In April, at The Hague, these activities were combined to form what is now Project Gemini. Both organizations have a global reach, with proven track records in addressing specific interoperability challenges. Both utilize the knowledge, talents and energy of dedicated volunteers – many of whom participate in the same working forums under both banners. Both IHE and HL7 hold connectathons. IHE connectathons are highly structured testing environments to verify that participants can properly implement profiles address use cases, while FHIR connectathons are primarily directed to explore and test FHIR capabilities among multiple participants with the objective of improving the FHIR standard. IHE has already been adapting many of its profiles to leverage FHIR, and more than 20 IHE profiles using FHIR have been posted on the FHIR Foundation registry. So, with all this happening anyway, why do we need Gemini? Well, the reason is to seize the opportunity to make even more progress by improving the way that both organizations work together. To date, we have established a joint steering committee, which will define how the collaboration will work. It will also serve as a central place where we can better communicate and coordinate work in progress, to minimize redundancy and reduce overall efforts. Through Gemini, IHE and HL7 can use our respective strengths to help each other out on specific projects and activities or to build awareness in geographic regions where one set of standards if more deeply embedded than another. But, more pointedly, the real opportunity is to combine our strengths on joint projects that will make a difference in achieving true interoperability on a broader scale by applying working standards to specific problems. The intent is to identify significant use cases which can be brought to market more quickly, usually by picking up work that may be part of a project already in progress in either organization and seeking to move the needle by advancing it step by step through a series of handoffs between connectathons so it can be put to productive use sooner. For example, a particular use case might be extracted from a larger project, defined as an HL7 FHIR connectathon track to assess FHIR resource and profile development, then passed on to IHE to be tested more thoroughly with additional participants in an IHE connectathon or plug-a-thon, and then passed back to HL7 with feedback to the next FHIR connectathon and so on in a succession of sprints. Such an agile process should impart a series of practical improvements leading to a more solid and widely vetted product at the end, embraced by a broader joint community of standards developers and implementers. IHE has the extra advantage of having annual connectathons in Europe and Asia-Pacific as well as the USA. This should mean that better, field-tested solutions can be prepared more rapidly, ready for use in multiple global regions through Gemini. Implementable Specifications focused on improving access to Immunology Records – this project will build on work such as the HL7 and CEN/TC251 International Patient Summary (IPS) project. While the ongoing IPS project seeks to broadly address coordination and continuity of patient care, the proposed Gemini project will seek to produce tested, implementable specifications for the limited scope of immunization records (using data elements from the IPS and the FHIR Immunization Resource) that can accompany individuals traveling across country borders. Implementable Specifications focused on the real-world exchange of DICOM images, diagnostic reports and associated discrete data elements relevant to cancer care between EHRs, radiology departments, patients and researchers using the FHIRcast content synchronization profile and imaging data access mechanisms defined under the NIH Sync 4 Science. Gemini is a new venture, and an ambitious one at that. It won’t be easy nor foolproof, so the steering committee is grateful to the HL7 and IHE boards for supporting this activity and encouraging this increased collaboration. Once we formally select the new projects, we’ll be reporting regularly, and Joyce and I plan to review progress at HIMSS 2019. In Greek mythology, the twins Castor and Pollux, who were, coincidentally, original Argonauts, were born of Leda. They were patrons of travelers, invoked by sailors to send favorable winds. Likewise, let us wish Godspeed to Project Gemini, toward making major strides in moving us further toward interoperability through the combined efforts of two great organizations.